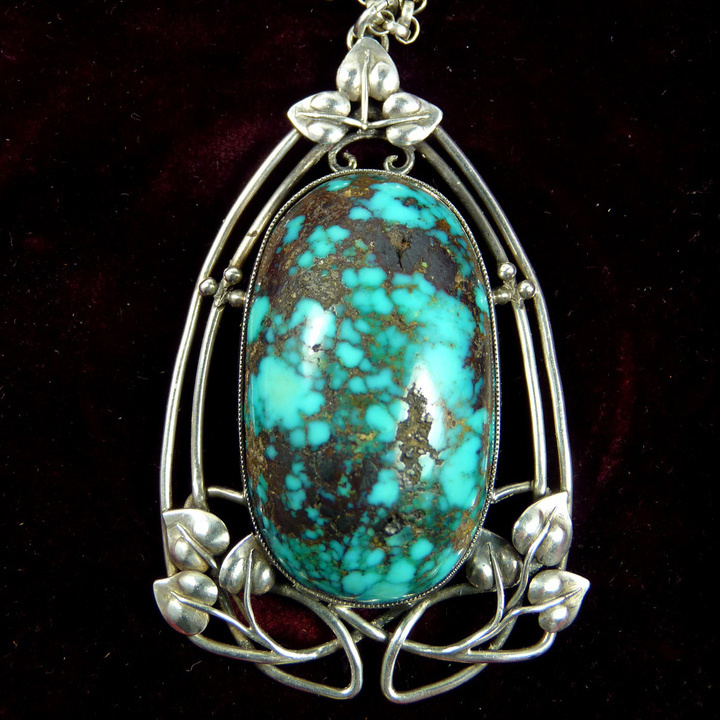 A Large Silver and Turquoise Pendant, designed by Archibald Knox for Liberty & Co. In Fine Jewelry > Art Nouveau Jewelry > Show & Tell and Arts and Crafts > Show & Tell. This Liberty & Co pendant is big, it's 50mm (2in) long, and the high domed turquoise cabochon is 35 x 20mm. It's unmarked sterling silver wire-work, with applied honesty leaf details. According to Stephen Martin in his essay "The Jewellery Designs of Archibald Knox" (Google this to download a pdf), these Knox designs with plant motifs are from his early period to 1900. One of the "tells" for these pieces is the mill-grain edge on the bezel, which you can see on several earlier pieces I've listed, including the first one, the wire-work silver and moonstone pendant. Yep, a lovely piece. Is it true Brad Pitt collects Mr Knox? you never know he might set up a Museum, which would be great. Those spider web turquoises are dreamful stones who tell stories! Hi Kyra, Yes it's a richly veined turquoise. Stephen Martin says, "In keeping with the Arts and Crafts tradition, Knox selected a variety of semi-precious stones for his designs but seemed to gravitate towards the blue-green colour scheme of turquoise and opal. 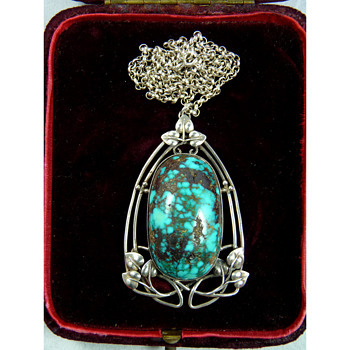 Although Persia was the principle source of turquoise at this time, I believe that Liberty’s also employed turquoise stones that were being mined in the American southwest and first came on to the market in the 1890s". I have one more Knox opal item I'm saving for a CW Collection I'm putting together on the history of Australian opals, watch this space in a couple of months. A lovely piece Paul. I've not seen this design before. Thanks Jewels, and thanks for your input on the first few pieces I put on CW. If you look at the first two pieces in the Collection I've just created (Liberty & Co Jewellery) you'll see I've followed up on your comments re the Gaskins and Bernard Cuzner. Finding this piece recently made me re-think the earlier Liberty & Co pieces, and I'm now confident most of them were by Knox. Cheers, we must get together for a drink next time I'm in Sydney, or if you ever come to Auckland. Super Paul. I'll drop by & have a look tonight when I have more time. I'm interested to see what you've been up to. The thing with Knox, I find, is that he was so prolific that I suspect he designed a lot more for Liberty than can be obviously identified. So it starts to get a bit murky in my mind. What stands out about his designs, for me, is his unique interpretation of the organic line. Do you know what I mean? He has a ridgeness to it that is almost anti-organic. I guess that comes from the strong celtic approach. Anyway, the good news for me is that you didn't take my comments as being rude which I later thought might have happened. I like a bit robust discussion when it comes to what makes a good attribution. In person, its fun but online can seem a little pushy. I'm always questioning myself as well. Drinks would be good, let me know what you're up to. I live & work centrally. I'm also very interested in the relationship or link between Knox/Liberty and the Anglo-Celtic jewellery makers. Particularly those pieces with the little rubies & gemstones that are unmarked. Do you know the ones I'm referring to? Could that nice bit of Liberty be a big silver butterfly shape with turquoises on the wings, and the 1903/4 quatrefoil stamp? No it's not, but I did have a punt on that one. Loved the design but it needed some expensive restoration. My one is via a dealer in the UK. It's a version of one Belle Epoque has. With leaves and mother of pearl. Also recently got a festoon enamel Liberty necklace. Needs some restoration but those are getting so rare now. Will post photos when I have time (and some nice sunshine). I love the way Liberty made all different versions of the same design. Hi Paul. I just posted the unmarked pendant I was talking about. I'll also post a Cuzner brooch for you. Good example of Cuzner's leaf work.